Remember in my last BlogHer15 recap post where I mentioned there may have been a "Blogger Brush Your Teeth" theme going on? (Refresh your memory on that HERE). Captain Aquafresh wasn't the only one at the BlogHer Conference promoting better oral hygiene! 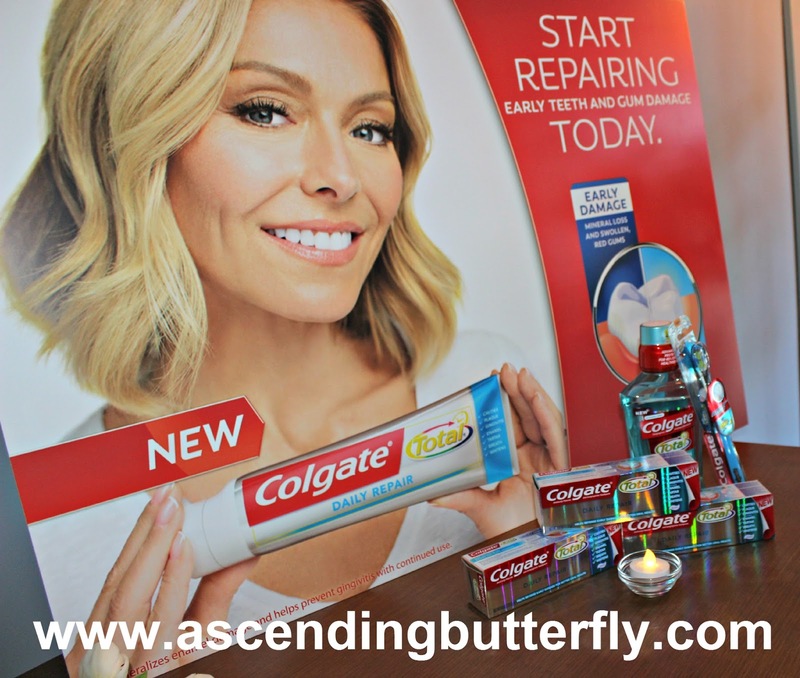 Ƹ̵̡Ӝ̵̨̄Ʒ - To meet with the Colgate Brand Team and members of Colgate's Research and Development team to get a sneak peek of the newest product launch - the introduction of the New Daily Repair Toothpaste! Ƹ̵̡Ӝ̵̨̄Ʒ - Indulge in a professional foot massage to repair your feet from walking the showroom floor! Ƹ̵̡Ӝ̵̨̄Ʒ - Leave with a swag bag with the new toothpaste! It helps re-mineralize weakened tooth enamel to help prevent cavities and strengthen teeth and help improve gum health by killing bacteria that cause gingivitis. (in 4 weeks; results improve with continued twice daily use, as shown in six month clinical studies; compared to regular flouride toothpaste.). I have to admit that the foot massage gave me life, my feet needed the TLC, and the odd thing is the masseuse I got when it was my turn is the very same one that massaged my back a few days earlier at Getting Gorgeous (see my coverage of Getting Gorgeous HERE). As big a city as New York is, what is the odds of something like that happening? Major Shout Out to Colgate-Palmolive Company for the foot massage! What is your favorite toothpaste brand? Any Cavities? FTC Disclosure: This is a non-compensated post, however the Colgate-Palmolive Company did supply bloggers with a swag bag of product during the BlogHer15 conference where I attended as a sponsored brand ambassador for Vitabath. Toothpaste was provided for Editorial Consideration, no monetary compensation has been received in exchange for this post and my opinions are 100% MY OWN. This post does give me a contest entry to win a trip to Canyon Ranch! I am disclosing this in accordance with the Federal Trade Commission 16 CFR, Part 255 - Guides Concerning the use of endorsements and testimonials in advertising, you may check our Giveaway and Disclosure Page for additional information regarding Ascending Butterfly Disclosure. Colgate really is my favorite brand! And a foot massage is a little bit of heaven on earth. It certainly is! I think it's a fun idea that Colgate took care of her from head to toe! Oh man, I could've used the foot massage. I posed with Aquafresh Man, but Colgate is the toothpaste that has my heart, I mean mouth. I've used Colgate for years. I just recently switched over to their whitening brand, and it's great. I can't say that I have a particular favorite brand of toothpaste. However, I do have ones that I prefer over others. Colgate would be one of those brands. We have used Colgate for years. A foot massage sounds great right about now. I could have totally gone for that foot massage and finding a way to take better care of your teeth at the same time sounds like a total win to me! I could use a good foot massage lol. I like Colgate and use it mostly. Nope, no cavities here!....no new ones at least lol. I love using colgate. One of the kids prefer aim. My boyfriend prefers sensodyne. We do like Colgate. Grandkids use this at our house. What a lovely pampering! I could use a little TLC, let alone twice! I'm glad you enjoyed it and learned a bunch while you were at it. We are a big fan of colgate. 90% of our toothpaste purchases is Colgate. Must be fun to attend blogher event. We have pretty healthy mouths in our family. We are a Colgate toothpaste and rinse family. I used Colgate Whitening toothpaste for years and always felt like it produced some fantastic results. After the week I've had, I am totally jealous of your foot rub! We do use Colgate toothpaste. I think it is probably my favorite. I love Colgate! They are an amazing brand and work great. It's so important to keep your teeth healthy! It can be so painful if you have to lose them! I am a big fan of Colgate products as they really do work! There is nothing like trusting one's teeth and the results to a trusted brand since childhood! How fun that you got the same person. A good foot massage makes me ultra happy! I actually just got a new Colgate in the mail this weekend with a tooth whitening pen. Can't wait to try it. We've been using Colgate for years and we love Colgate Total. The kids had seen the Charcoal and they'd like to try it. Sounds like a great event! Colgate is our go to brand as well. I always love seeing their new products! We are big Colgate fans here too. It works amazing and it's affordable too! A foot massage sounds great about now! Love Colgate, it is my favorite! That sounds like a great event. We like to use Colgate for years. Taking care of teeth is so important. I try so hard to have my kids as focused on this as I am, so we have toothpaste and tooth brushes upstairs and downstairs. Oh heck yes, I would love a foot massage. We use Colgate in my family. My kids love the flavors too! Colgate is one of my favorite hygiene brands – they are always coming up with something new and innovative. I'd like to try a toothpaste that re-mineralizes weakened tooth enamel. We have been using Colgate for about six months and i love the results. My gums are healthier and my teeth are nice and white. Now that sounds awesome! I foot massage while at a conference sign me up. I would have loved to go to this event, the foot rub seems like an added bonus to this awesome event. So Jelly! BlogHer is on my conference list for next year! So cool they had a gifting suite with Colgate. I love companies that treat bloggers right. So glad you enjoyed your foot massage.